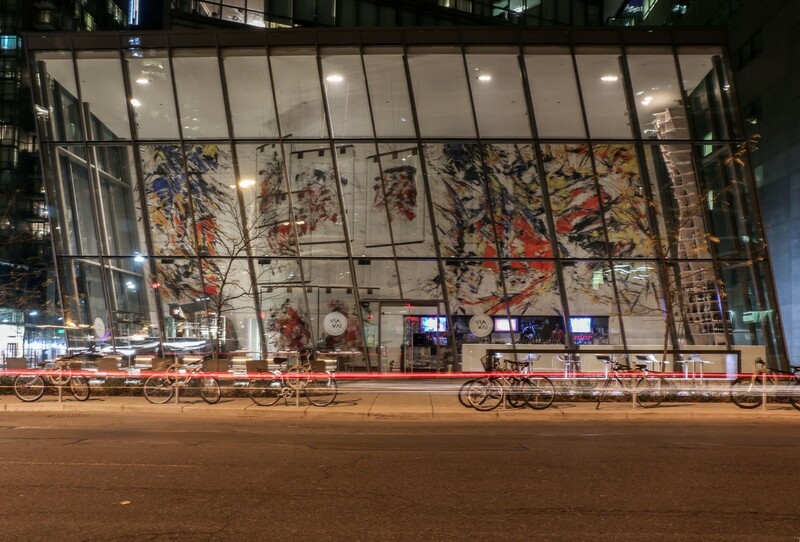 Some of Toronto’s finest art is right out in the open. 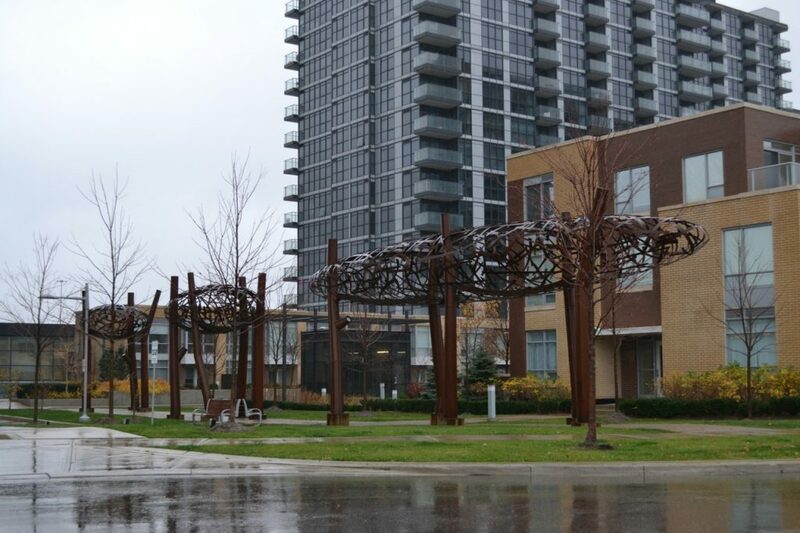 The city boasts scores of public works everywhere from Regent Park to North York. 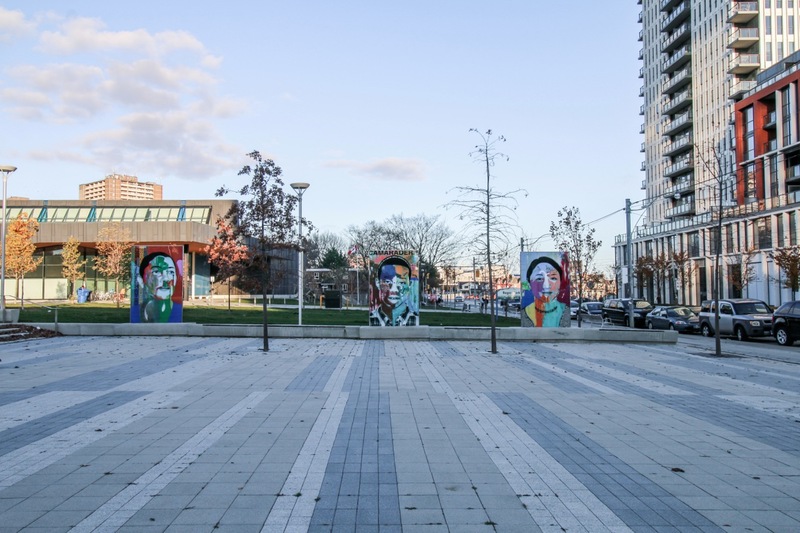 And as builders continue to start and complete projects here that incorporate art, the collection is only getting larger. 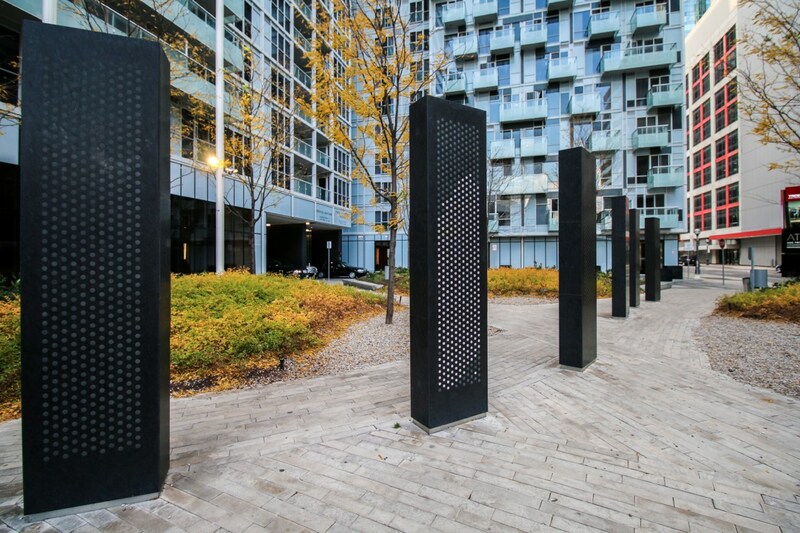 Since our last photo tour in the summer of 2014, a number of new pieces have gone up, including multiple fixtures at Canary District commissioned by Dundee Kilmer Developments Limited and Waterfront Toronto. 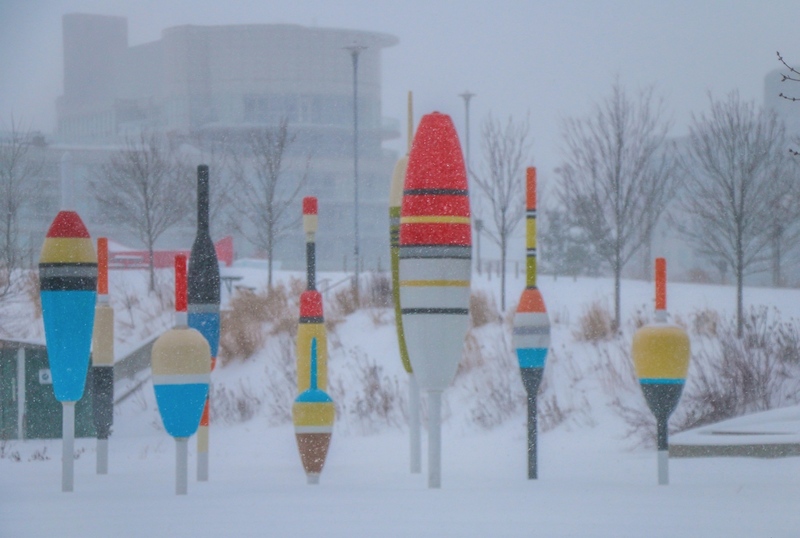 That (and the fact that there are too many to cover at once) encouraged us to go on another tour of public art. 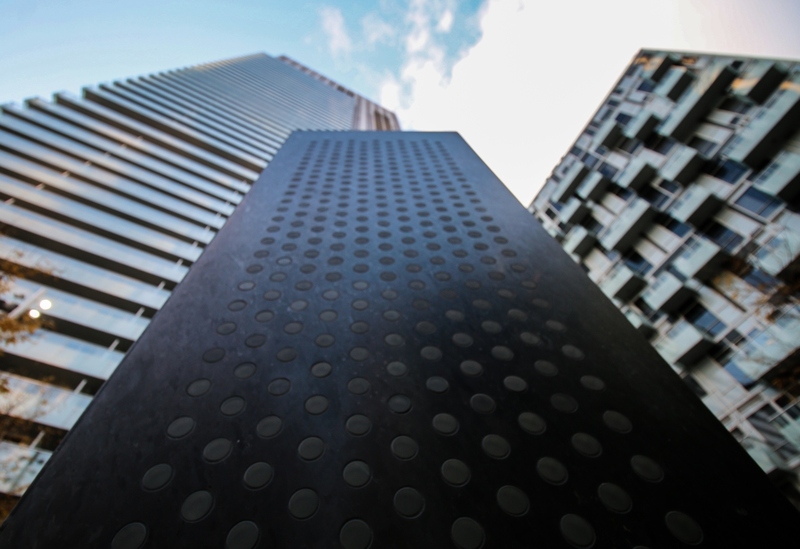 Check out the photos by BuzzBuzzHome’s James Bombales below. The Water Guardians by Canadian duo Jennifer Marman and Daniel Borins alongside stateside architect James Khamsi is more tactile than many other pieces you’ll find in the public realm. 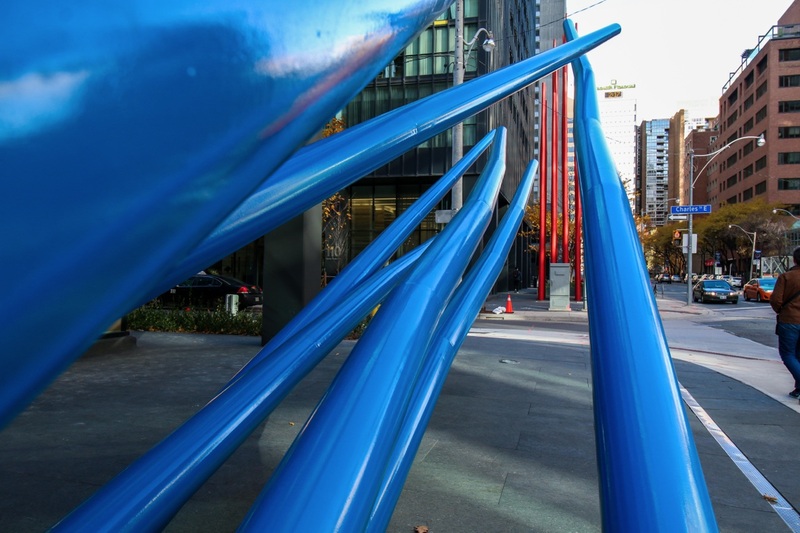 Its bright blue impressionistic form may be eye catching, but it’s the piece’s base, made of a squishy, bouncy material that encourages interaction. Lamp posts have stories to tell. 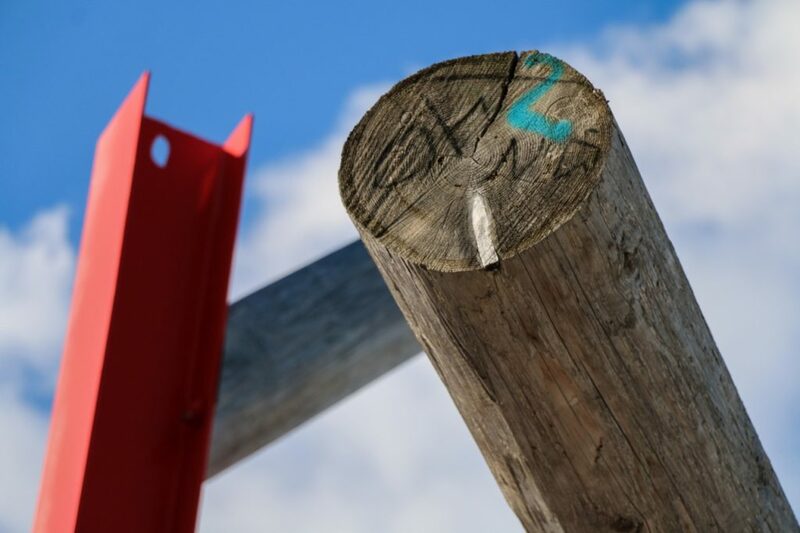 As with most anything else, different styles of lamp posts have fallen in and out of favour over the years and varied from place to place. 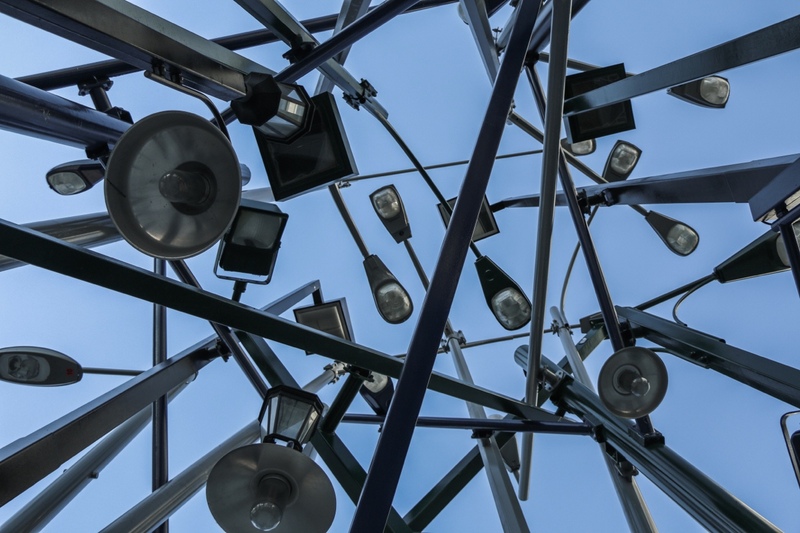 To compose this illuminating untitled piece, world-renowned Japanese artist Tadashi Kawamata culled lamp posts from yards and depots. He then improvised their arrangement instead of executing a long-term plan. 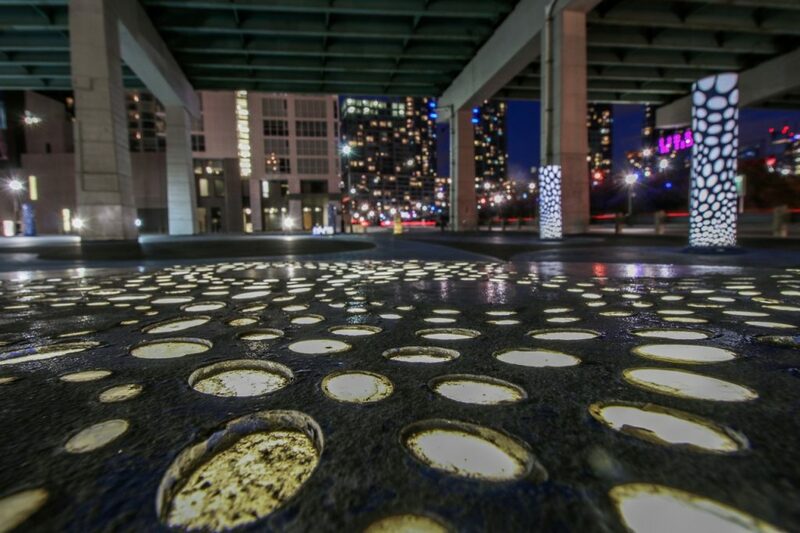 Where the Distillery District and the Corktown Common meet, the pavement peels revealing the past. At least that’s the impression Jill Anholt’s sidewalk instalation is meant to give. 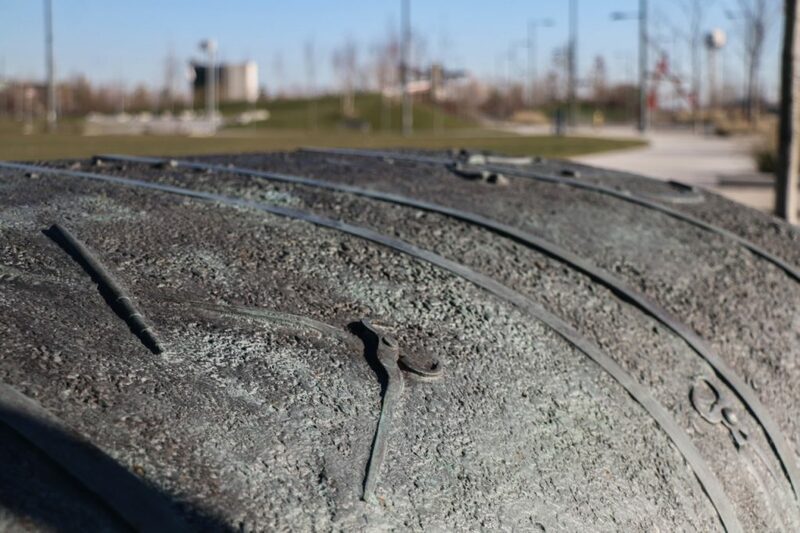 Located along Mill Street, which connects the two areas, peeled pavement is adorned with tools, a nod to the Distillery District’s industrial roots. 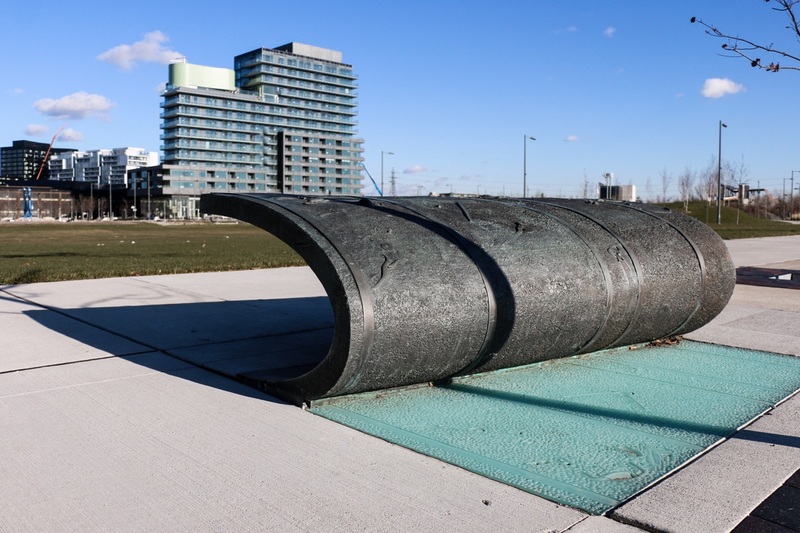 Though No Shoes is the oldest piece on our list — it actually dates back to 1967 — it was restored and relocated in the Corktown Commons in 2013. 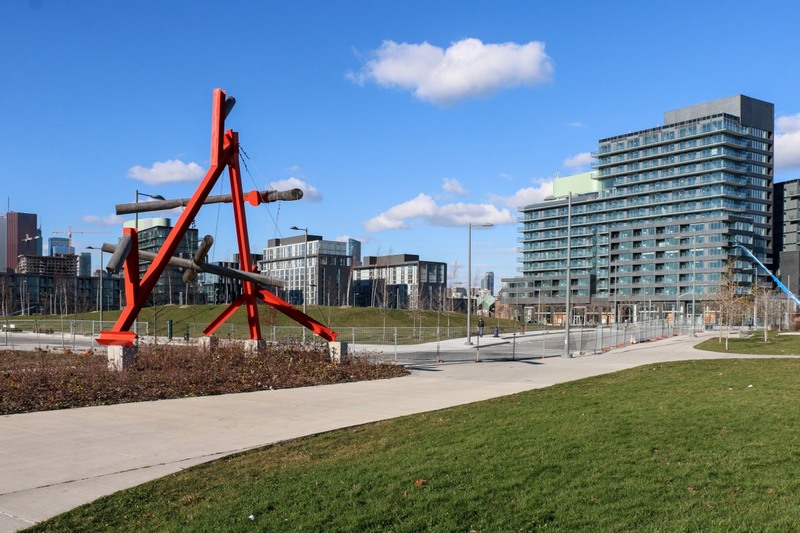 The move gave this work from Mike di Suvero, who earned a US Congress National Medal of Arts in 2010, a second life after the mostly beam and lumber instalation had been left in a state of disrepair in High Park for years. 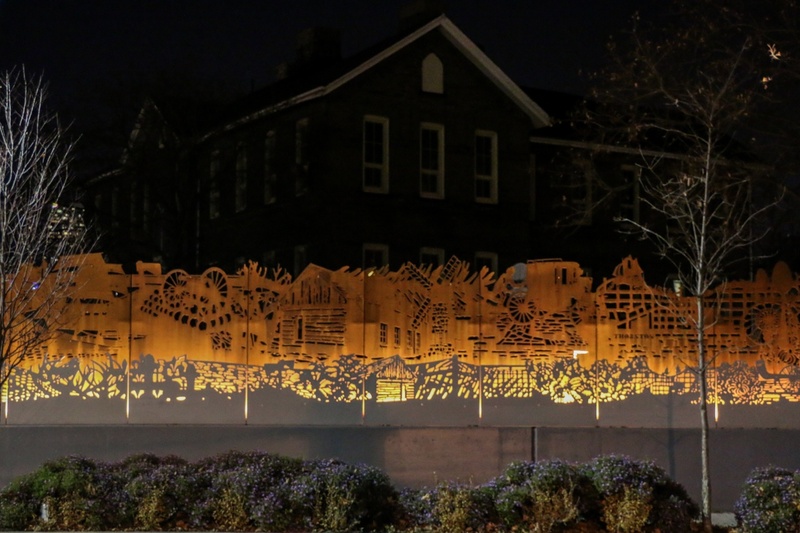 With Site Specific, artists Scott Eunson and Marianne Lovink wanted to create a work that spanned the location’s history. “This concept is presented as a timeline-based visual narrative via two complementary layers of delicate and evocative silhouette imagery,” Lovink writes in a statement. 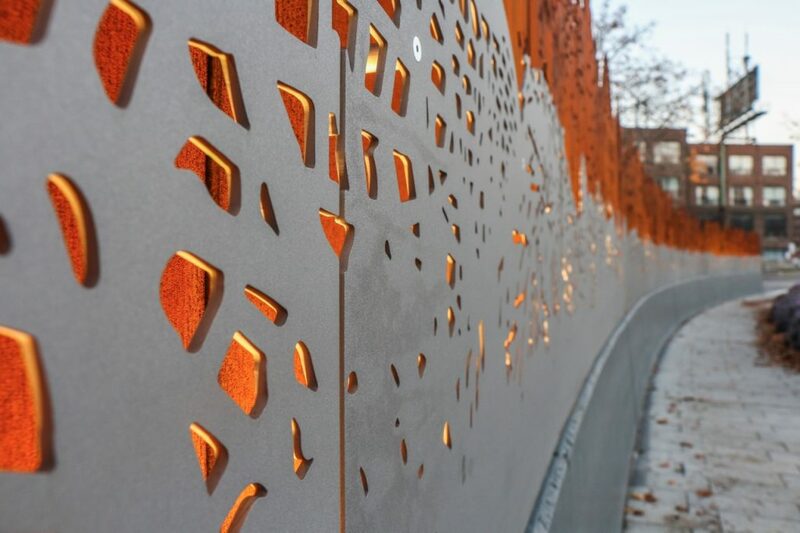 The imagery adorning the corten-and-stainless-steel piece was gathered from sources including photos, paintings, maps, and even archeological artifacts. As its name suggests, optical illusions spurred by climatic conditions are the inspiration behind architect Paul Raff’s Mirage, located underneath the Richmond-Adelaide overpass. 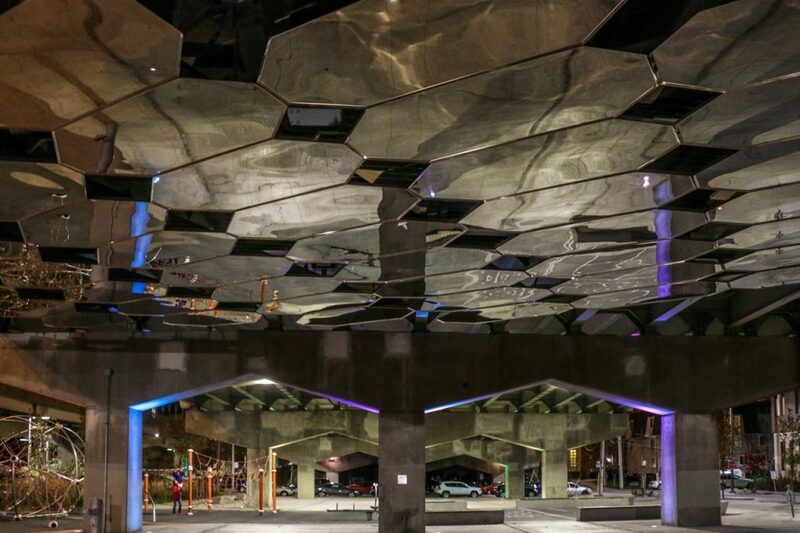 Mirage is made up of nearly 60 mirrored octagons that reflect light to trick the eye into seeing movement in a static space. 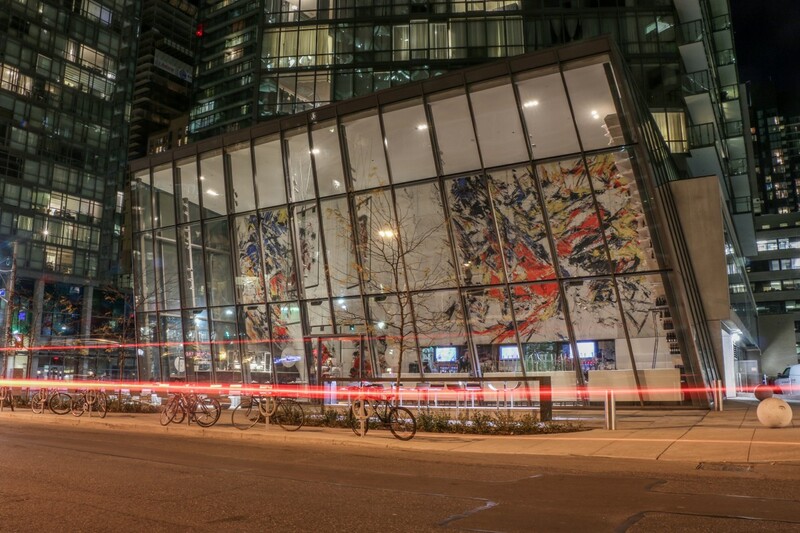 While many recent public art installations highlight modern construction techniques or technology, Sandro Martini took an old-school approach when commissioned to create the installation that would occupy the ground floor of Burano Condominiums on Bay: Martini created a sprawling fresco called Glass Memory. 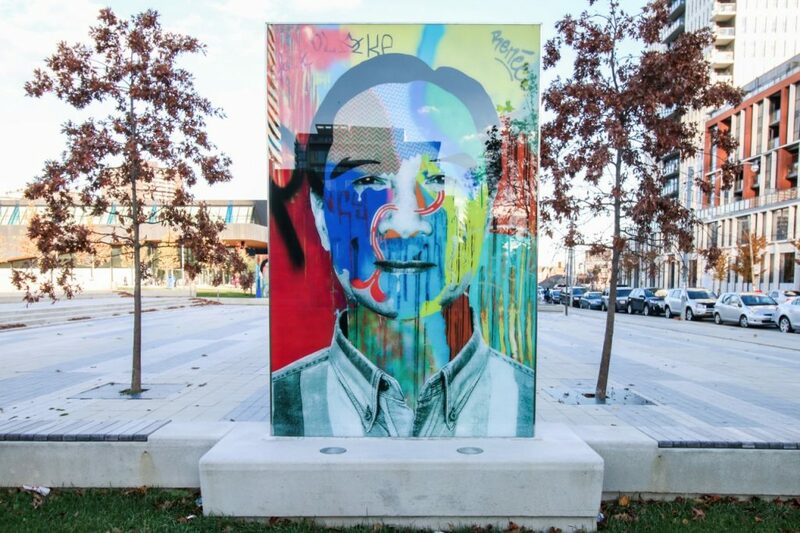 It also features complementary paintings on glass that utilize the simple simple colour pallet of red, blue, yellow, and black. 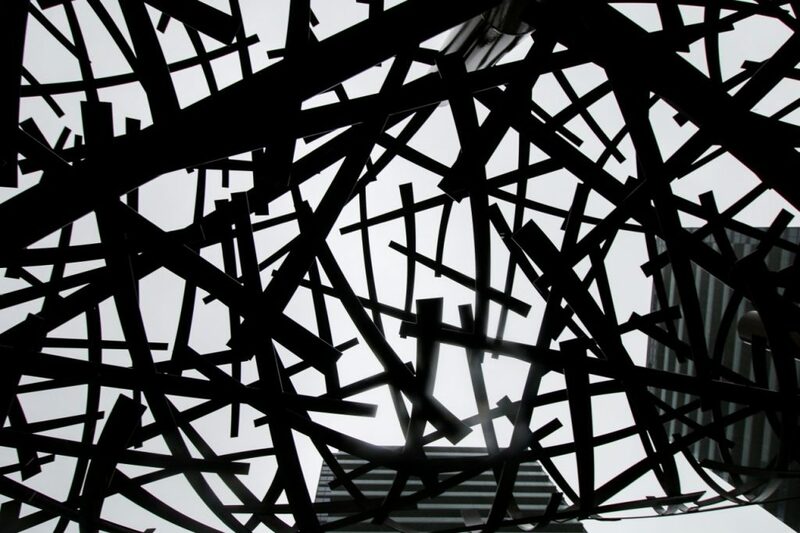 Summer Clouds is Finnish artist Jaakko Pernu’s take on the conventional pergola. 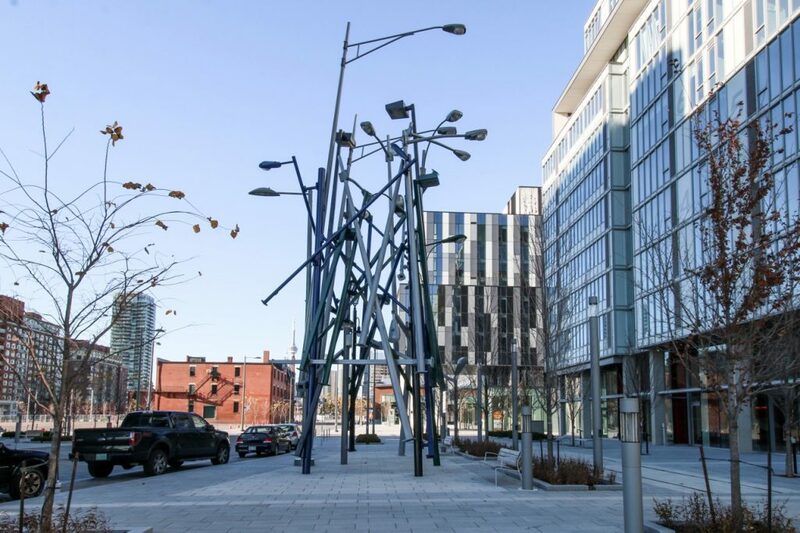 The work includes a trio of abstract cloud sculptures that straddle a walkway at block 19-20 of the Concord Park Place Development. 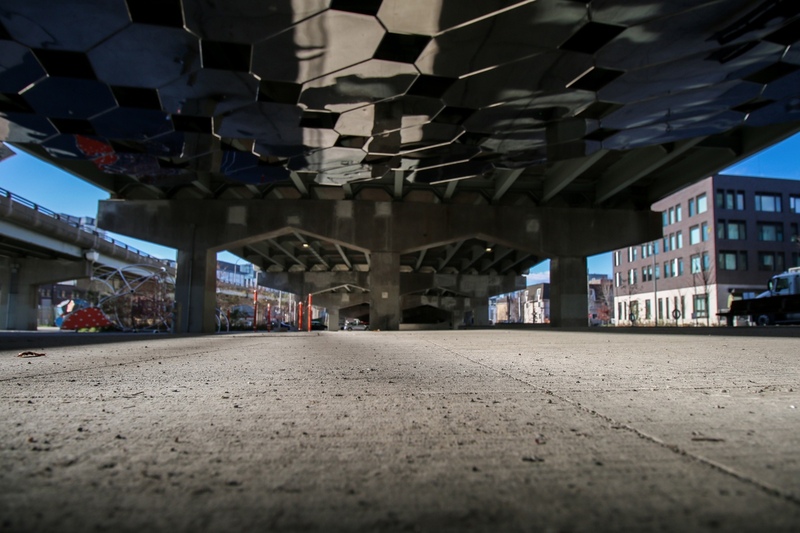 While real clouds block out the sun, these let sunlight to pass through, throwing interesting shadows on the concrete beneath. 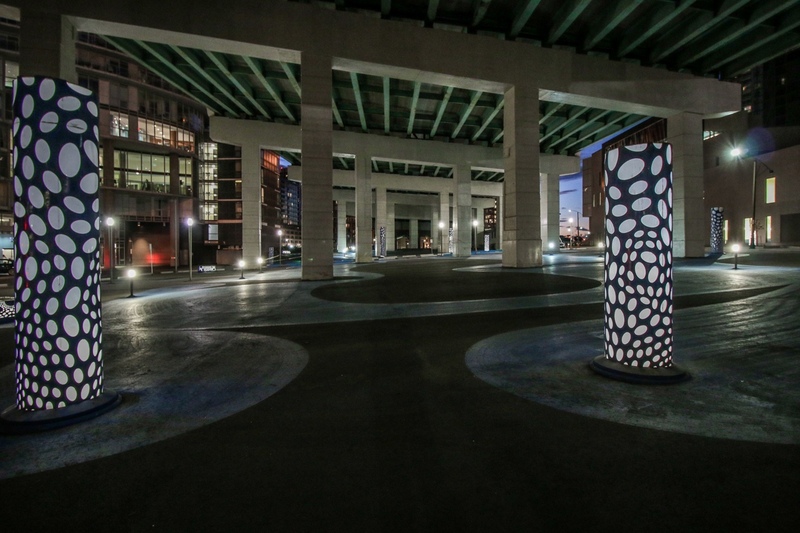 The sculptures aren’t all about form, though: at night, the three sculptures light up the residential pathway. 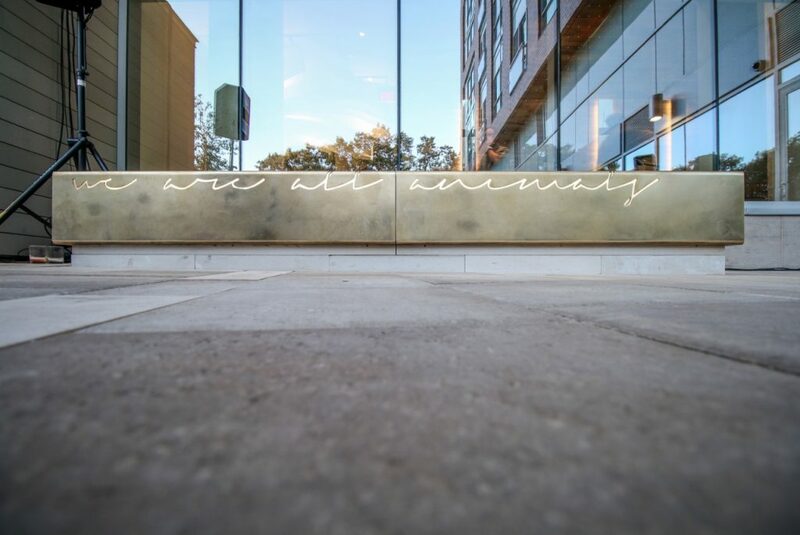 This responsive installation by UK-based artist Jason Bruges’ studio reflects the actions of passersby using many small LED lights mounted on imposing granite forms. The black, rectangular structures can also pick up changes in the weather and the shadows cast by trees. 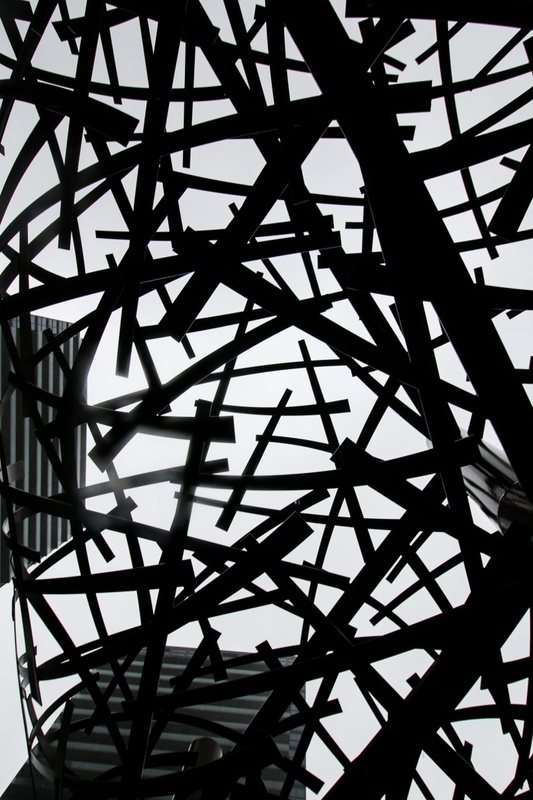 American artist Vito Acconci’s Fence on the Loose is about the breaking down of boundaries. “The ideas come from thinking that a space doesn’t make sense unless it’s a people space,” Acconci says in a Lanterra Developments video on the piece. 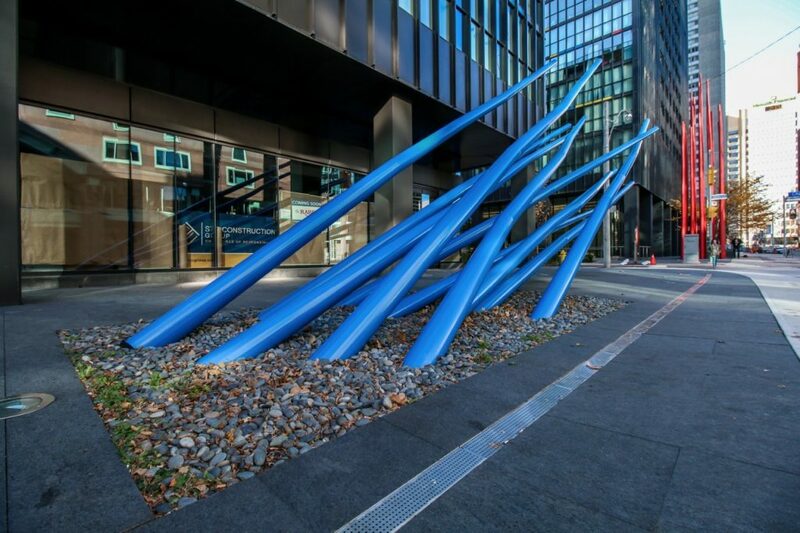 The fluid sculpture is, in essence, what happens when you twist and warp a fence. 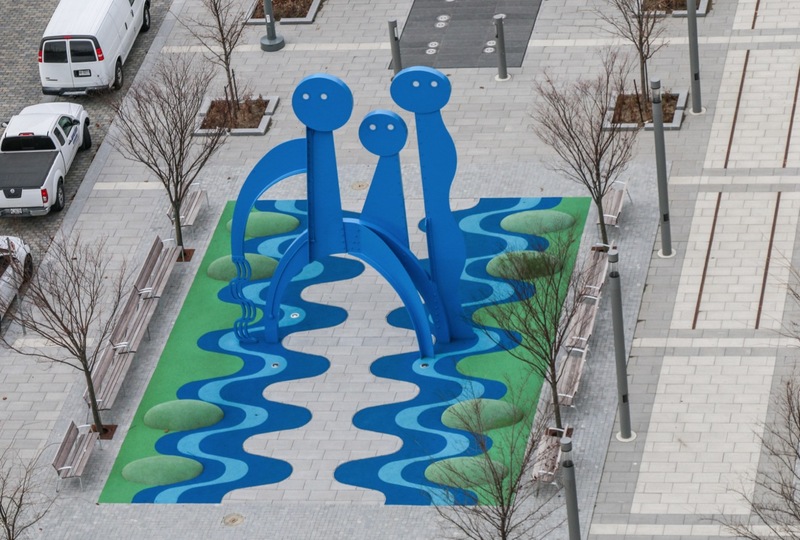 “We hope that if you stretch a material, maybe you allow people to stretch something in them,” he adds. 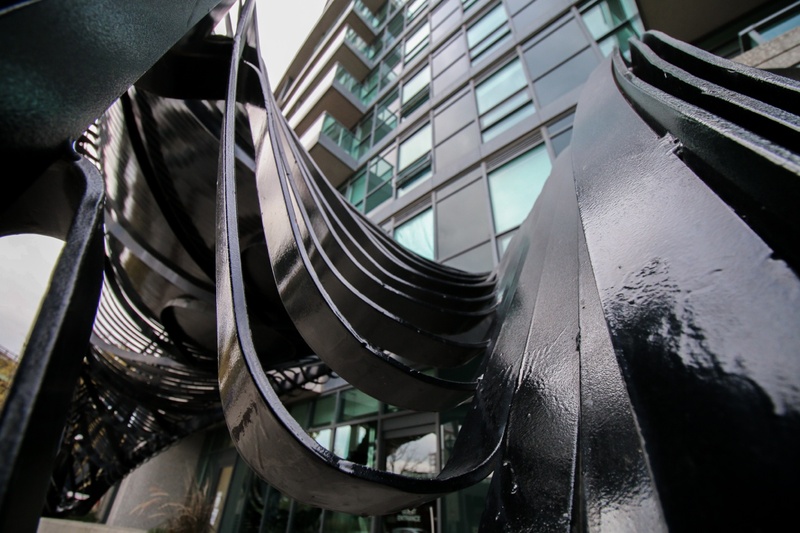 Shayne Dark’s Double Take at X2 Condos plays off Double Vision, his earlier work located at the neighbouring X Condos. Here, in addition to a colour changeup (Take’s blue contrasts with Vision’s red), the followup work reaches towards its successor rather than shooting straight upwards. 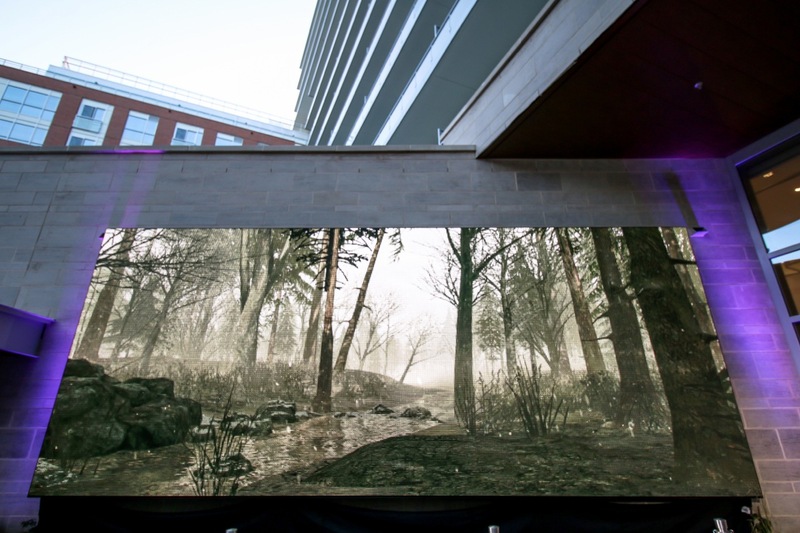 We Are All Animals is a mixed-media instalation from OCAD students and Public Studio, an art-architecture firm, that’s comprised of coyote sculptures, a bronze bench, and earthy visuals displayed on an large LED screen. 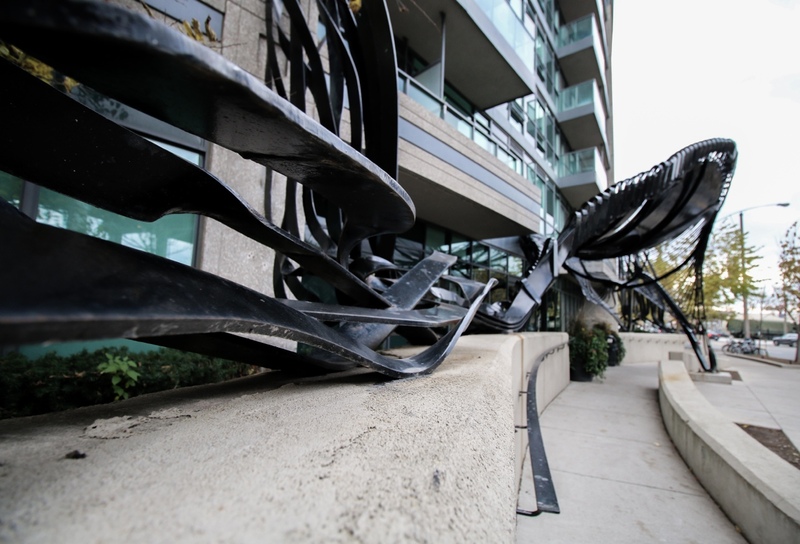 The work references natural elements of High Park, which is right across Bloor Street from the piece. 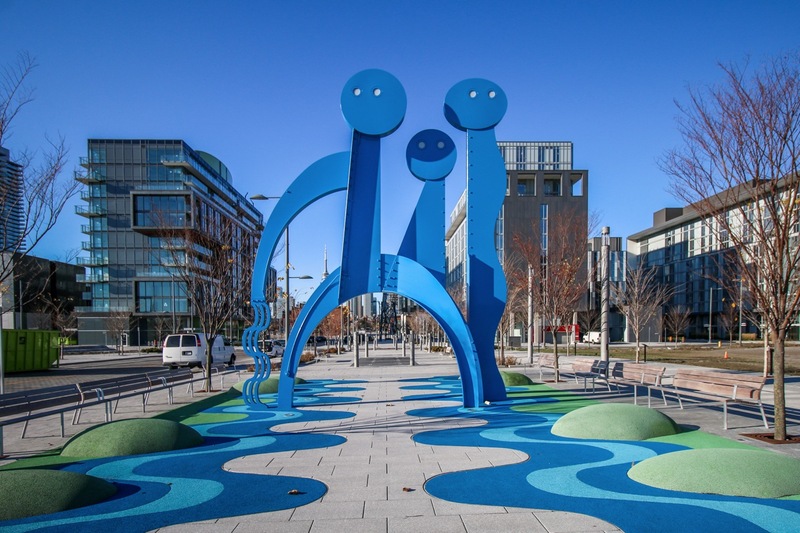 Float Forms, erected in 2008, is just one of Canadian author Douglas Coupland’s variegated public-art pieces that dots Canoe Landing Park by Concord Adex’s CityPlace development. 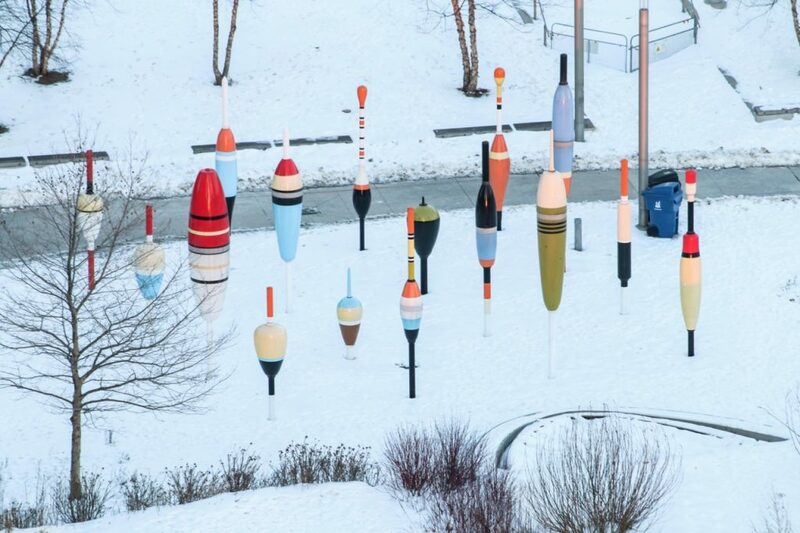 The eclectic piece, made of steel and resin, is comprised of multiple colourful bobber — fishing gear used to maintain the hook at the target depth — sculptures of varying sizes and patterns.